Mayors from around the country will converge on the Tornillo Port of Entry. Mayors from around the nation and across the political aisle converged on a border town Thursday morning to protest President Donald Trump's family separation policy. During a press conference in Tornillo, Texas, some 20 miles from El Paso, a bi-partisan delegation of more than a dozen mayors collectively described the aftermath of the new immigration policy as "cruel," "inhumane," "unjust," "immoral," a "humanitarian crisis" and a "moral crisis." "We are better than this," said Los Angeles Mayor Eric Gracetti, a Democratic member of the group. "Children are not poker chips; they are people. We demand that Washington fix the mess that it has created." Trump, appearing to cave to the global outrage and immense political pressure, signed an executive order on Wednesday ending his administration's controversial policy of forcibly separating immigrant families at the border with Mexico. But thousands of children have already been taken away from their detained parents. (Joe Raedle/Getty Images) Seattle Mayor Jenny Durkan speaks with a Department of Homeland Security Police officer as she is told she cannot cross through the gate to the tent facility setup at the Tornillo-Guadalupe Port of Entry as she joins with other mayors from the U.S. Conference of Mayors to call for the immediate reunification of separated immigrant families on June 21, 2018 in Fabens, Texas. The delegation, whose members strongly opposed the policy, is calling for the immediate reunification of these families and for Congress to take action to ensure this doesn't happen again. 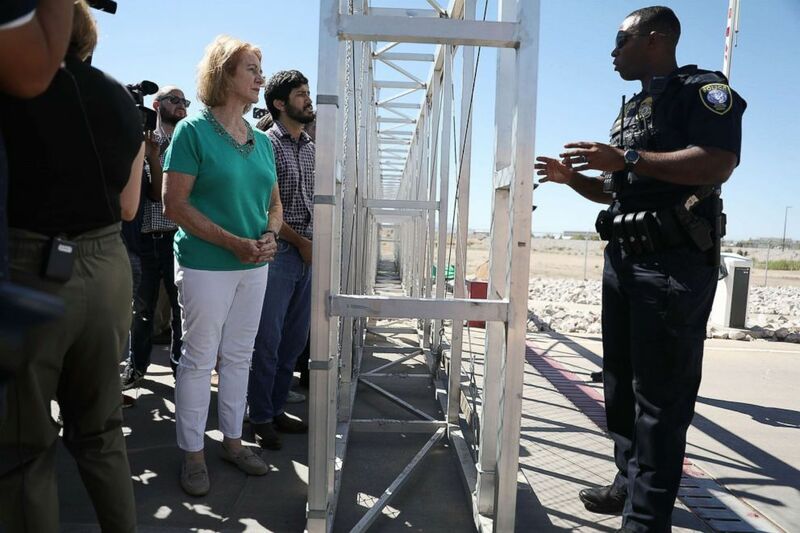 The mayors traveled to the Tornillo Port of Entry, where the Trump administration has erected a temporary tent city to house the influx of unaccompanied immigrant children. "There are more than 2,300 children -- some as young as 8 months-old -- who are frightfully alone and must be reunited with their parents as soon as possible, and there is no clear answer as to how this will be done and how quickly," said Steve Benjamin, the Democratic mayor of Columbia, South Carolina, who is also the president of the U.S. Conference of Mayors and led the group to Tornillo. "The president's indecision and erratic policymaking has impacted and, frankly, traumatized thousands of lives," he added. (Brendan Smialowski/AFP/Getty Images) Mayors speak to the press outside the Tornillo Port of Entry where minors crossing the US-Mexico border without proper papers have been housed after being separated from adults, June 21, 2018 in Tornillo, Texas. The U.S. Conference of Mayors, a nonpartisan organization of cities with populations of 30,000 or more, organized the trip prior to Wednesday's executive order, after unanimously passing a resolution condemning the separation of families. The delegation included Democratic and Republican mayors from California, Washington state, New Mexico, Texas, Indiana, Michigan, Ohio, Georgia, Florida, South Carolina, New York and Rhode Island. In addition to the reunification of families, the mayors called for Congress to get to work on a long-term, comprehensive solution to the nation's "broken" immigration system. 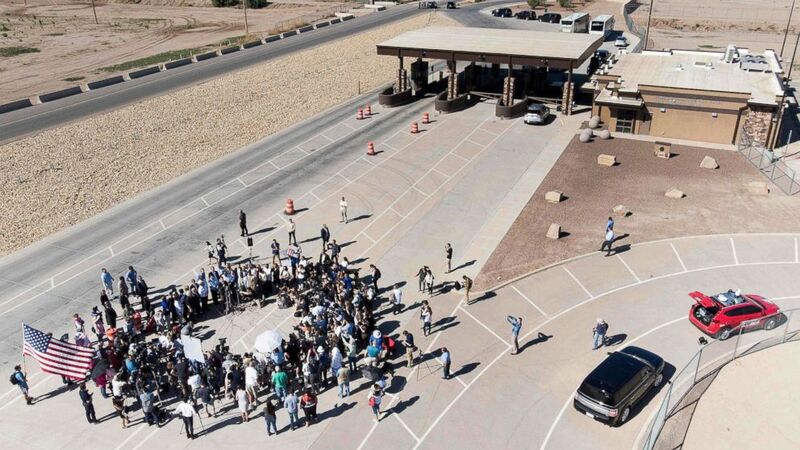 "This is where immigration should be discussed, not in Washington but here on the border," El Paso Mayor Donald Margo, a Republican, told reporters. "We are the community that is the poster child for immigration and bi-cultural relations and has been for over 400 years." The Trump administration's "zero tolerance" policy, enacted by U.S. Attorney General Jeff Sessions in early May, stated that everyone who tries to cross the southern border illegally would be criminally prosecuted, and that parents will be separated from their children as they await trial. 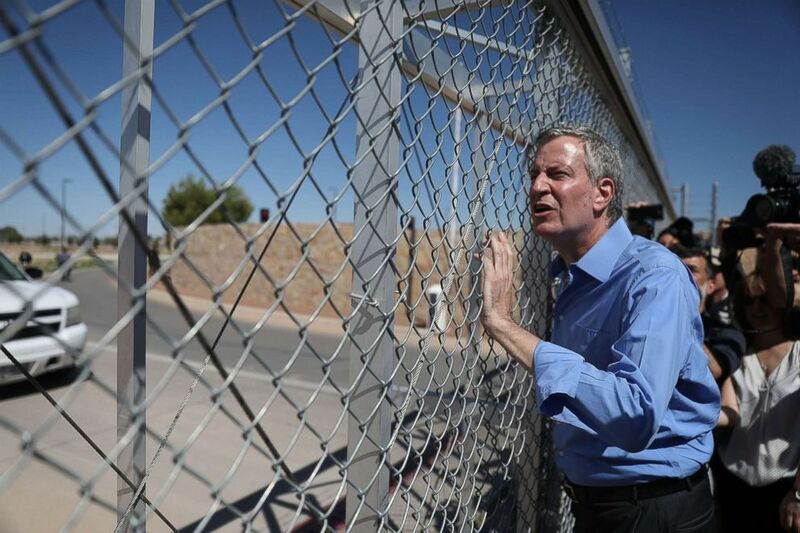 (Joe Raedle/Getty Images) New York City Mayor Bill de Blasio stops at a gate after being told he could not cross through the gate to the tent facility setup at the Tornillo-Guadalupe Port of Entry as he joins with other mayors from the U.S. Conference of Mayors to call for the immediate reunification of separated immigrant families on June 21, 2018 in Fabens, Texas. The policy sparked outrage across the nation and abroad, with protesters taking to the streets in cities from Los Angeles to New York City. On Wednesday, Trump said the "zero tolerance" policy would continue but his executive order is "about keeping families together while ensuring we have a powerful, very strong border." "I didn't like the sight or the feeling of families being separated," Trump said. "Anybody with a heart would feel this way." 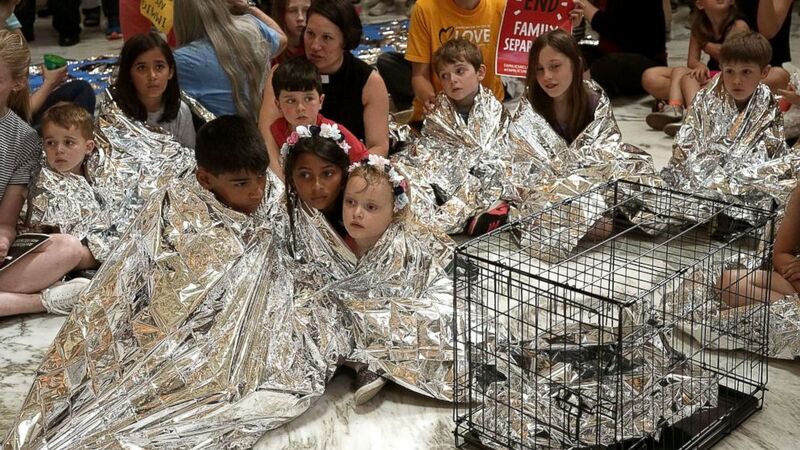 (Alex Wong/Getty Images) Children wrap themselves up with Mylar blankets to 'symbolically represent the thousands of children separated from families on the border, sleeping on floors and held in cages', during a protest at the rotunda of Russell Senate Office Building June 21, 2018 on Capitol Hill in Washington, D.C. Activists staged a demonstration to protest the Trump Administration's policy to separate migrant families at the southern border. The delegation of mayors called Trump's executive order "merely one step" in the right direction "that still leaves many questions unanswered." Seattle Mayor Jenny Durkan, a Democrat, said countless children who have already been separated from their families are being "parceled out like commodities in the dead of night" to places thousands of miles away from their detained parents. "Nothing we are doing today makes our country any safer and instead it degrades the moral conscious of our country," Durkan, a former federal prosecutor, said at the press conference in Tornillo Thursday morning. Miami Mayor Francis Suarez, a Republican, said he's been unable to gain access to the facilities where unaccompanied immigrant children have been bused to in his city. "I cant even imagine the pain that parents are feeling and the trauma the children are going through," Suarez told reporters. "We’re a country of immigrants; that is what made us strong and what made us special." New York City Mayor Bill de Blasio, a Democrat, revealed how he was shocked to learn that more than 200 children who were recently separated from their families at the southern border are currently at an immigration foster care center in his own city -- and nobody told him. "These kids have been traumatized. These kids are suffering, physically and mentally," de Blasio told reporters in Tornillo. "Think of how broken that is, and our government didn't even tell us it was happening."